In this ecosystem consisting of hawks, snakes, rabbits and grass, the population of each species can be studied as part of a food chain. Disease can be introduced for any species, and the number of animals can be increased or decreased at any time, just like in the real world. This is a STEM activity relating to the Food Chain Gizmo. This STEM activity can be completed after students understand how organisms are impacted in a changing ec... (more)osystem. Working in small groups, students work to identify components of a food chain. This worksheet can be used... (more) before the Food Chain Gizmo to assess student pre-knowledge of elements of a food chain. The activity should be modified to meet the level of the students. 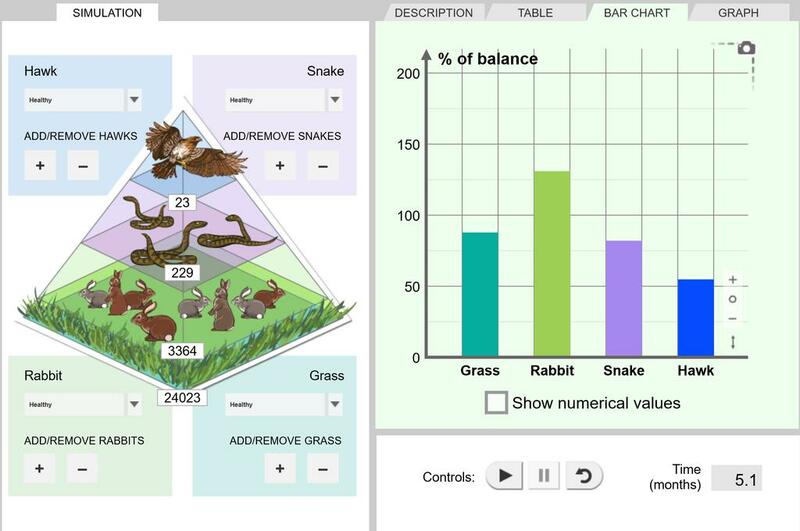 This CER worksheet allows students to interpret a graph to determine how changes in organisms affect othe... (more)r organisms in a food chain. Then they state a claim based on the results shown in the graph, explaining the evidence and the reasoning that links the evidence to the claim. This lesson plan is an implementation of the Smarter Science Inquiry Framework applied to the Food Chain ... (more)Gizmo. NECAP is the New England Common Assessement Program and serves Vermont, New Hampshire and Rhode Island. ... (more)This GIZMO has been adapted to reflect the style and format of the NECAP Inquiry task. Using the Vocabulary Sheet within the Lesson Info I created a simple vocab quiz by cutting the terms and ... (more)pasting them at the bottom as a work bank. Created using old exploration guide. Does not have any instructions about increasing or decreasing number... (more), just effects of disease. Includes tables to organize data. Used for SNC1D - Ontario Curriculum. Before using this Gizmo and talking about food pyramids, I like to play this simple game with students. I... (more)nstructions are embedded in the PowerPoint file. Works great to show a population graph and leads nicely into the more complex relationships shown in the Gizmo. Great way to analyze cause and effect relationships using data about organisms in an ecosystem. Students had previous knowledge, but many "lightbulbs" went on and many more were brightened as they went through the process! Excellent, students were very focused and motivated. with advanced students quick way to visualize long term effects. The Food Chain Gizmo does an excellent job of showing what happens to parts of a food chain when a part of it is altered. My Students really enjoyed it, great gizmo! A simple way to teach a sometimes difficult topic. Great to use after we played a game outside called "Oh, Deer". It is two teams of deer and natural resource (water,food, shelter, space). Great way to teach student about the Food Chains and the Energy Pyramid. This gizmo fits quite well with the Alberta grade 7 curriculum pertaining to pred.& prey dynamics. Clearly shows how impacting one member of an ecosystem impacts all of them, and how equilibrium will eventually be restored. My 5th grade kids LOVED this - whacking out nature is always fun for 5th graders, but I think they really saw the consequences of it, too! Excellent simulation for teaching about producers and consumers or predators and prey in an ecosystem. Neat concept for showing how each member of the food chain is interconnected.